Yesterday I shared the first part of Michelle's salvation story. Today I'm happy to bring you the rest of the story! In 2002, I had complications giving birth to my second daughter. I lost a lot of blood, my blood pressure dropped to deadly lows, and I passed out. I could hear all the doctors and nurses running around frantically and then I saw nothing. I felt at peace. It was short lived and I came to and went home like nothing happened. After my ordeal at the hospital, I just couldn’t understand why God would let me live. I sometimes got lost in thought about why I was here and I didn’t feel like I had done anything worthy of living this life that was given me. I felt like a complete waste. How could God even care about me? I just disappointed Him constantly. I was a failure. I had, in essence, killed my dad and my brother and caused so much havoc in my life. I really thought God had made a mistake letting me live. And I carried that around with me for a long time. Then one day, I was invited to a Bible study at a new church we were attending. At this point, it was 2007, I now had 3 children, and even though I had this confusion about God, I still wanted something from Him. I still wanted Him to accept me. I wanted to know how I could earn that again; how I could get back in His good graces. I opened the book to the lesson we were discussing. It was on salvation. I don’t remember who wrote it. I just remember reading it and my eyes opening to what it said. The words were in a quotation bubble and stood out from the rest of the page and said, "You cannot earn your salvation. There is nothing in you that God finds worthy. He offers this free gift to because of His great love for you." To any other person, this was not news. But to me, it was everything. I spent my whole life struggling to please God and earn His salvation and that one phrase rocked my entire world. I felt like God wrote that phrase on the paper just for me and then reached up and grabbed my heart. I kept repeating the phrase over and over the next week. "I can’t earn His love. I am not worthy of His love. His gift is free." He changed my view. I didn’t have to earn His love. He had already given it to me long ago. My life was no longer complicated with trying to earn His love. Instead, I was loved so much I wanted to show that love to others. The simple struggles of life no longer seemed like punishments but opportunities. His love saved me from myself. I’d like to wrap this up in a pretty bow, but life is never a pretty package. This past year rocked my faith again when I found my loving Mother dead in her bathroom last June. Was God still good? Did He still love me? I didn’t feel it. I seeped into a deep depression. I went into hiding. I cut off ties with people that cared about me the most. I hated God. I vented on my blog about how much I didn’t understand Him. Slowly, God is bringing me back to a place where I am ok. To say that a month ago would have been a stretch for me. But by God’s grace, I am ok. I am learning that God uses my pain for His glory and He ordained me "for such a time as this." I am learning to be content in every situation, although that is not always easy. Most of all though, I’m learning that God is my rock. However painful this might be, He has prepared a place for me. He will turn my mourning into joy. He sings over me. I love Him because He first stretched His hand out to me and loved me, without strings. I'm so glad that Michelle has been willing to tell her story here! I hope you'll leave her some comment love, or visit her blog to read more. Wow. Great story Michele. I'm so glad you found that there is nothing you can do to earn God's love. He is indeed your rock and he has brought you this far. And He's not done yet. Not yet, my friend. I appreciate you. Thank you for sharing your story! Thank you for sharing this with us. Sometimes we can detach from God and it takes a lot to bring yourself about. I was a kid of 10 years old when I turned against God and it was after a death. However at 10 years old I remember but don't hold myself accountable. Sometimes I wonder where the inner strength comes from, other times I need reminders. It's amazing how all the stories are different, yet we try to package "how to be saved" into five or ten magic words and leave it at that. Evangelism can't be limited to tracts and altar calls, ya know? So glad God opened your eyes to the Good News. Thank you for sharing your story! @Moe, I appreciate you too! Thanks for reading all of that. @cindy, I definitely still need reminders. It's like the hymn says "Prone to wander, Lord I feel it, prone to leave the God I love..." I think we all are prone to wander. @mostlyquestions, that is so true. I remember handing out those tracts as well. I think that you can say you want something but to feel it within yourself is a totally other story. I think both the mind and the emotions need to come into play when you accept Christ or you will probably just be angry and confused, much like I was. How good of Michelle to share her story! Hearing personal testimonies are such a delight and an encouragement! Our God is so big and so good. 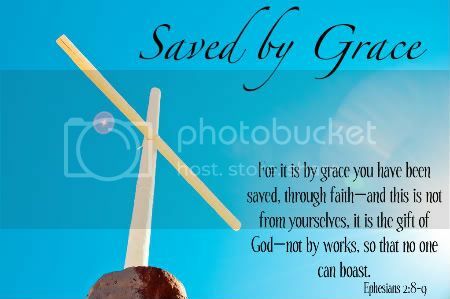 "by God's grace, I am ok."
To quote a song title, "His Grace Was Greater". Thank you Michelle for baring your story and journey. You are loved. so proud of you michelle!! you ARE loved! !